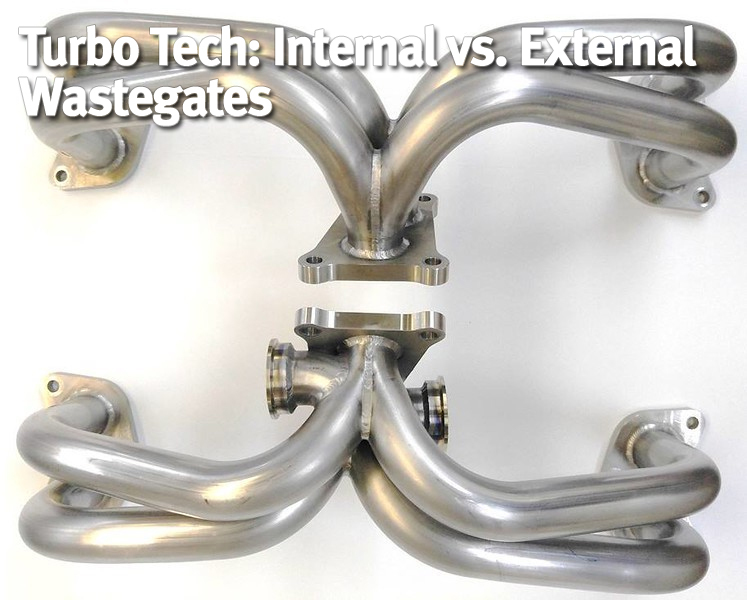 Before we get into the numbers and reasons why a dumped external wastegate makes more power than an internally wastegate turbo configuration, let’s discuss why internally wastegated turbos are used by the OEMs. The first concern of the OEM is emissions; therefore all exhaust flow must flow through the catalytic converter. Can an external wastegate setup be configured so that the wastegate flow goes through the catalytic converter? The wastegate flow from an external gate most certainly can be plumbed back into the downpipe and into the catalytic converter. So, this brings us up to the next reason OEMs use internally wastegated turbos: simplicity. The internally wastegated turbo comes to the OEM from the supplier as one part and therefore also one part number. The OEM hooks up oil lines, water lines, compressor and turbine inlet and outlet connections, and maybe a couple of vacuum lines or electrical connectors to this one turbocharger part. Let’s say the OEM decided to go with an external wastegate configuration that was plumbed back into the downpipe. Now there are extra part numbers for the external wastegate and clamps, adding complication to supply base and logistics. On the design side, the OEM has to design more complex exhaust manifolds and downpipes with extra flanges and bellows joints. If the turbo is a twin-scroll setup, that’s double of everything. Then, the OEM has to do their own validation testing for durability and quality. Every extra weld and joint has to be validated for quality and testing durability. A 2000 hour durability cycle testing is common. As you can imagine, running an engine dyno cell for 2000 hours is not cheap (facilities, technicians, fuel, electrical power to the cell, etc). If the OEM gets the internally wastegated turbocharger all in one package, that greatly reduces costs and failure points. 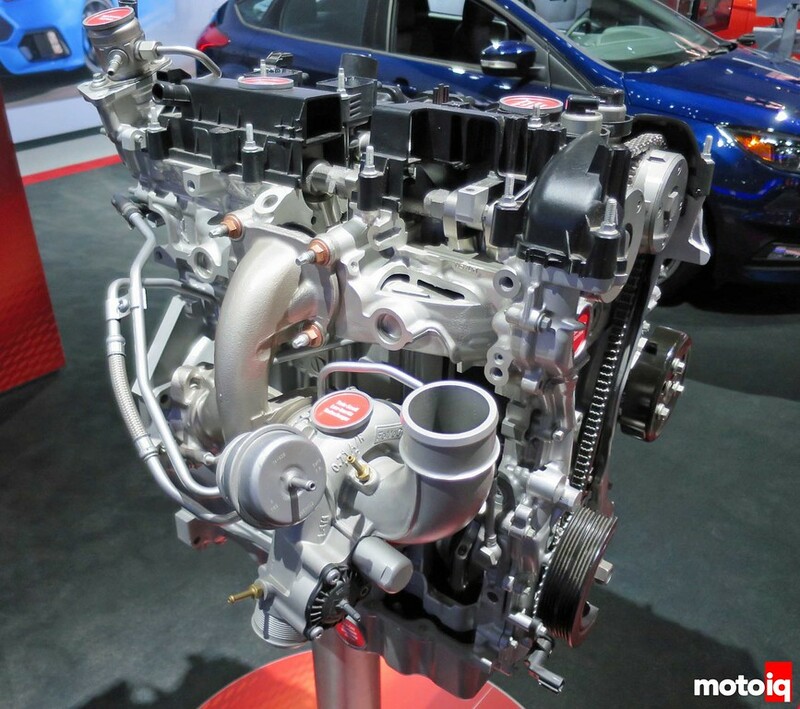 This is the Honeywell (Garrett) turbo on the 2.3L Ecoboost engine on the Focus RS. It’s a twin-scroll with internal wastegate, and the compressor bypass valve is even integrated into the compressor housing. The turbo goes to Ford as one integrated and validated package and Ford bolts it to their engine. The last area of concern for the OEM is the size of the package space required to fit the turbocharger. On turbocharged gasoline cars currently in production, the largest turbos are about GT25-28 size. That’s to say, they’re not really big. BMW V8s use MGT2260s. The Focus RS uses a MGT2263. Single turbo cars are all in the 300-350hp range. Twin turbo cars are in the 600-650hp range, for the most part. So, the size of an external wastegate is quite large relative to these turbos. Finding space to fit external wastegates becomes a bigger problem in these often very cramped engine bays. Visualize trying to put a pair of external wastegates in the middle of the V of the German twin-turbo V8 engines. 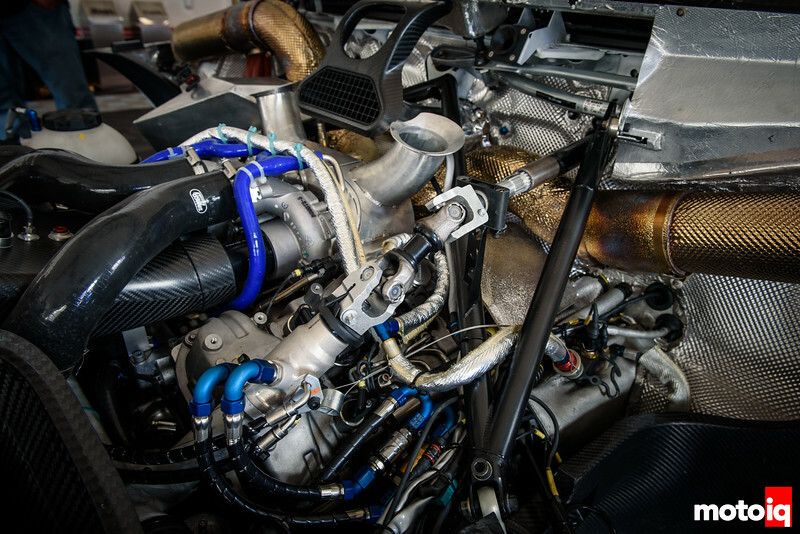 This is the nearly stock BMW M6 engine in the Rahal Letterman Lanigan GTLM car with a pair of the stock Honeywell internally wastegated twin-scroll turbos. Notice how tightly everything is packaged around the turbos placed in the middle of the V. Imagine trying to package four external wastegates in there. Okay, so we know why the OEMs go with internally wastegated turbos. But why does it give up power to externally wastegated configurations and how much power does it give up? The ‘why’ is easy to explain, the ‘how’ is much more complicated. The ‘why’ simply comes down to exhaust back pressure. Remember that the turbine wheel is an exhaust back pressure multiplier. Whatever back pressure the exhaust system creates gets multiplied by the turbine wheel. Bigger exhausts, test pipes, and high flow cats all allow the engine to make more power by reducing back pressure. If you remember our article on turbo sizing, you’ll remember this data we generated by using the Borg Warner MatchBot program. The goal was to show how exhaust back pressure gets multiplied by the turbine wheel. In this example, at 8000rpm, a reduction of exhaust system back pressure of 2psi resulted in a reduction of pressure in the exhaust manifold by 4.4psi because the turbine was operating at a pressure ratio of 2.2.